QUESTION: My wife and I have been watching a pair of bluebirds feeding their young in one of our nest boxes for nearly three weeks. We have become concerned that perhaps one or more of the babies cannot get out, as it seems well past the time the young birds should have fledged. What should we do? ANSWER: If I were you, I would not be concerned over the fate of the young bluebirds housed in your nesting box. I would just sit back and enjoy watching the adults bringing food to their rapidly growing brood. Typically bluebirds will fledged when they are anywhere from 17 to 20 days old. When they finally begin vacating the box, it can take two or more hours for all of the youngsters to leave. However, it is not uncommon for one or two members of the brood to make their first flight the following day. If you would like to learn how to better identify birds, but simply didn’t know where to begin, this is the workshop for you. The workshop will focus on how you can identify the birds that you are likely to see in and around your home. The eastern towhee, sometimes called the joree, is a permanent resident through the Peach State. 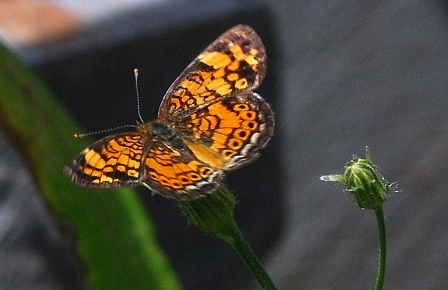 Here it can be found in backyards that feature patches of shrubs. The eastern towhee spends most of its life on or within a few feet of the ground in its dense shrubby lair. Here it builds its nest and feeds. When looking for food, the bird scratches through fallen leaves in search of hidden seeds and insects, spiders, sow bugs and even small snakes and lizards. 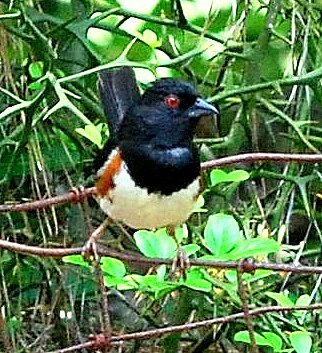 The towhee is more often heard than seen. I know that you have probably heard it singing. This eight-inch bird sounds like it is saying drink-your-teeee. This secretive bird also often calls to-hee or joree. The female eastern towhee looks much like the male depicted here, with the exception that the in those places where the male’s plumage is black, it is brown instead. The Eastern towhee will frequent bird baths and feeders. It prefer to feed on the ground. It is particularly fond of black oil sunflower seeds, however, it will also dine on millet, suet and white bread. The downward spiral of many of our native bee populations is something that we should all be concerned about. The plight of these insects was recently highlighted by a study conducted by researchers with the University of Vermont’s Grand Institute of Ecological Economics. Their findings suggest that between 2008 and 2013 native bee populations declined 23 percent across the United States. If you would like to learn more about native bees and what you can do in your backyard to promote native bee populations, I strongly urge you to read the April-May issue of the National Wildlife Federation’s magazine National Wildlife. This special issue is titled Garden For Wildlife – NURTURING NATIVE BEES. Chinese wisteria (Wisteria sinensis) blooms cascading down from tall trees are among our most beautiful spring flowers. However, this exotic import also has an ugly side. Chinese wisteria was brought to North America in 1816. It quickly became so popular throughout the south it was planted alongside porches, gardens, walls and arbors. However, it quickly became apparent that this aggressive vine has a dark side. It seems that it just will not stay put. As such, its seeds and long sinewy vines enabled Chinese wisteria to quickly spread across the countryside to such an extent that today many believe that it is native plant. When wisteria spreads it smothers out native plant communities and will even girdle trees as it makes it way to the tops of the tallest trees. As a result, homeowners, and land managers have long been trying to eradicate Chinese wisteria. Although it has been repelled and even eradicated in some locales, this is a war that will not end soon. If you enjoy the sight and scent of wisteria blossoms in your yard don’t turn to Chinese or its equally invasive close relative Japanese wisteria (Wisteria floribunda); instead plant our native American wisteria (Wisteria frutescens). This vine is not invasive and will display a bounty of gorgeous blossoms.